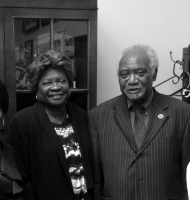 Commissioner Barbara McGowan, Vice President of the Metropolitan Water Reclamation District of Greater Chicago, recently met with Congressman Danny Davis at the Congressman’s Washington, D.C. office to discuss the MWRD’s sustainable initiatives. Vice President McGowan stated, “Established in 1889, the MWRD is an award winning, special purpose government agency responsible for wastewater treatment and storm water management in Cook County, Illinois”. © 7670 Chicago Hispanic Newspaper, Lawndale News, Hispanic Bilingual Newspapers, Su Noticiero Bilingue. All rights reserved. XHTML / CSS Valid.